I am not sure if we have said this before, so sorry if we have. For some reason, probably dating back to a documentary or travel film of some sorts in the 90s, we always talked about visiting Vancouver and particularly the adjacent islands. It was also the main inspiration for our JWalking adventure – we just seemed to have added a lot of locations around it (including Australia and New Zealand – how did that happen?). An early start and short ride on the Vancouver Skytrain and we were at the Pacific Coast Train Station. It is the west coast terminus for trains coming across Canada from the east and heading south into the USA. In it’s hey day, prior to air travel, it was probably a very busy place but today it has a somewhat leisurely pace. Amtrak and Rocky Mountaineer trains leave throughout the day but, just to be different, we were there to catch a bus! Well, more of a coach really. It is the BC Connector which took us south west of the city, almost crossing the border, to Tsawwassen to board a BC Ferry to Schwartz Bay on Vancouver Island. The trip was the usual JWalking style of things. The bus driver didn’t have a microphone so had to shout out information about the trip, what time to be back on the coach etc. Then the door wouldn’t open so we couldn’t get off! Sometimes I think they must know we have a blog and are providing valuable content. We did finally manage to escape from the coach to make our way up to the top deck on the ferry. 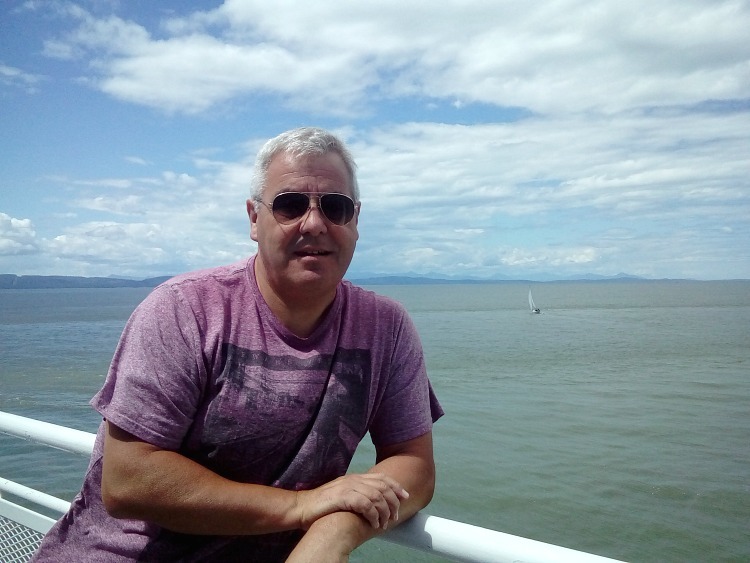 We knew that the views would be good and we reminisced about our last ferry crossing from South Island to North Island, New Zealand. The weather was perfect, although lots of people were dressed for an antarctic expedition and they very quickly headed inside to the cafeteria. 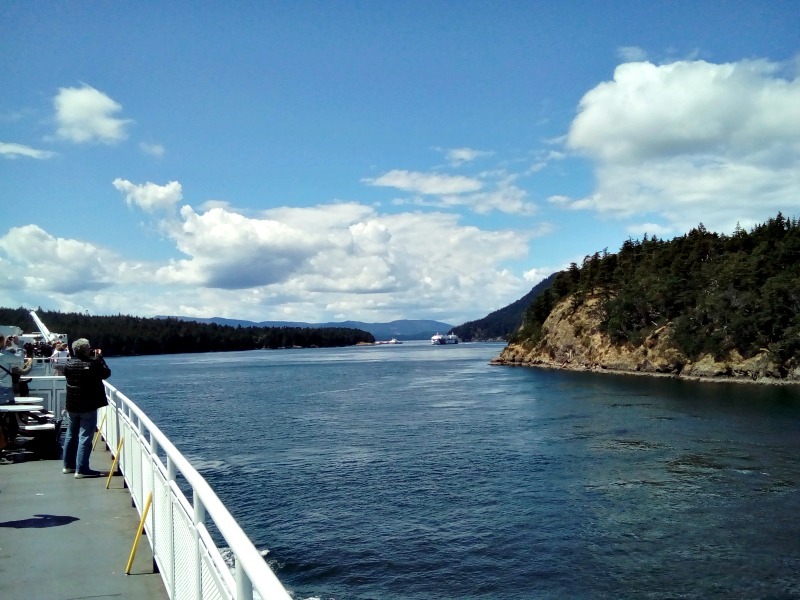 The crossing route weaved it’s way between Galiano Island and Mayne Islands through reasonably narrow channels, especially when passing the outward bound ferry. We could see lots of little, and not so little, homes scattered in the trees and the 90 minute crossing was just long enough to eat our lunch, al fresco of course. 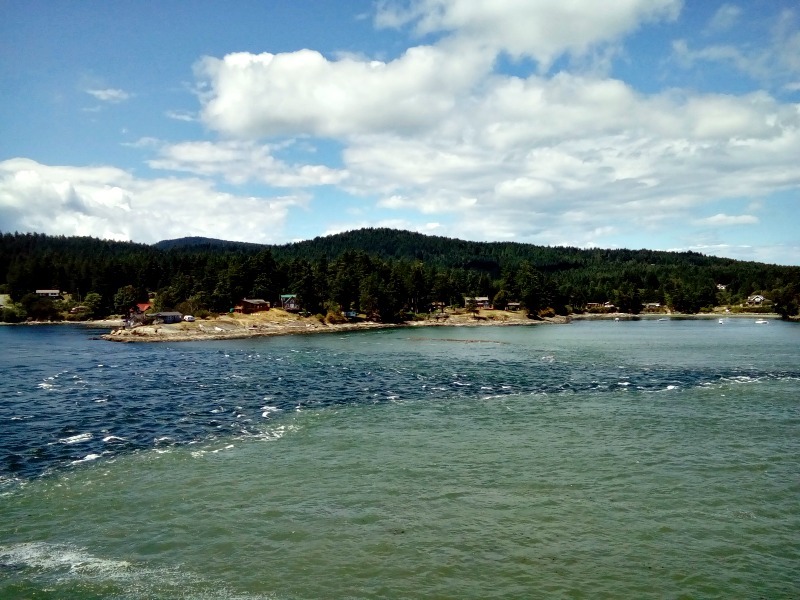 The channel widened out a little as we passed the Pender Islands and Salt Spring Island before arriving at our small port of Swartz Bay. We managed to get back on the bus without the use of a crow-bar and headed down the island towards Victoria. First impressions were that in this area it was a very busy island but it is the capital of British Columbia after all and we were heading for the centre. 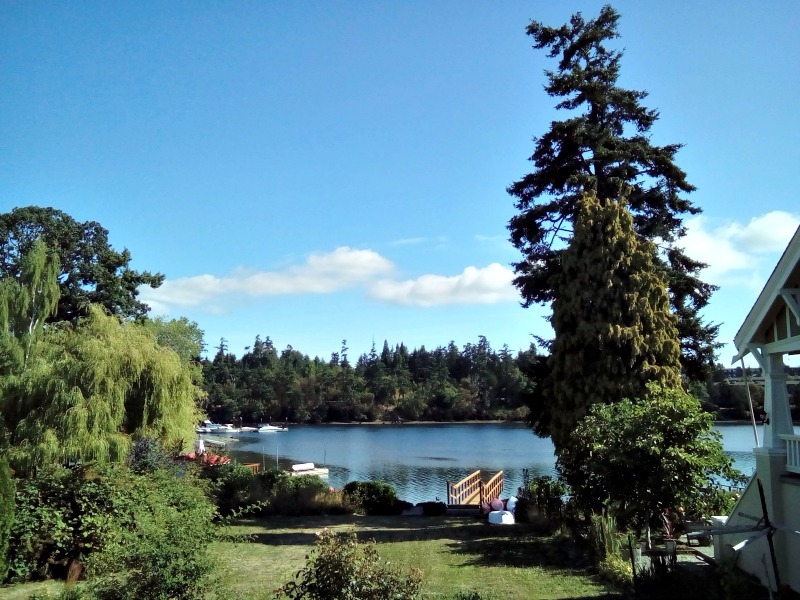 After waving goodbye to our shouty driver, we caught an island bus to our Airbnb on the peninsula north west of the city in the district of Esquimalt. This large peninsula was inhabited by First Nations people for over 400 years before Europeans arrived. Nowadays the west coast of Esquimalt is home to the Royal Canadian Navy’s Pacific Fleet. Our Airbnb is on a quiet suburban road but it is not until you see the garden and view that you get that wow factor and a taste of the landscape that borders the busy city. Our hosts, Chris and Laura, were very apologetic about having to head over to the mainland for a few days but this has resulted in us having the whole house to ourselves. 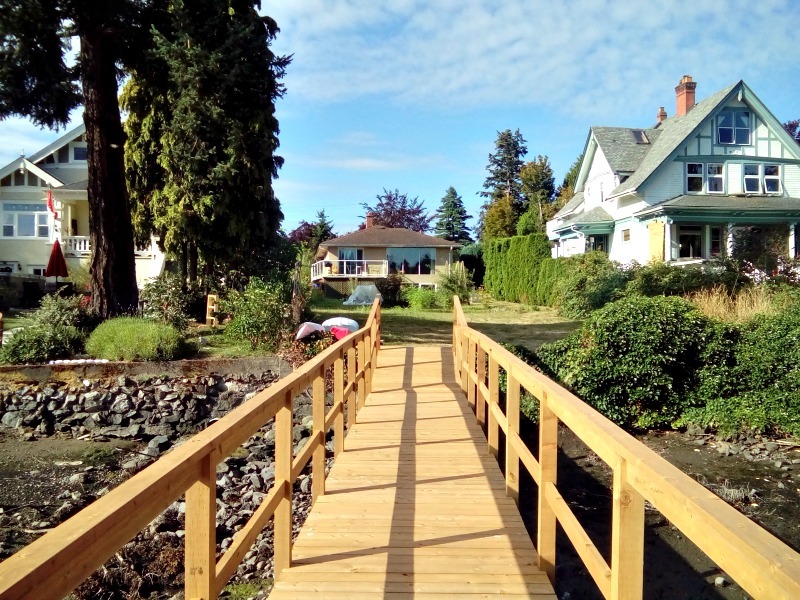 The deck faces the Gorge Waterway which has occasional canoeists, paddle boarders, rowers, swimmers and tiny little water ferry boats poodling by. I also volunteered for garden watering and it has been lovely to spend an hour or so in the evening watering the multitude of berries, fruit and vegetables in the series of vegetable boxes and tubs that are here. Despite the temptation to head to so many places further afield, we decided to explore the local area and waterway first. It felt tantalising to see the forest opposite and water flowing by without doing a bit of JWalking. 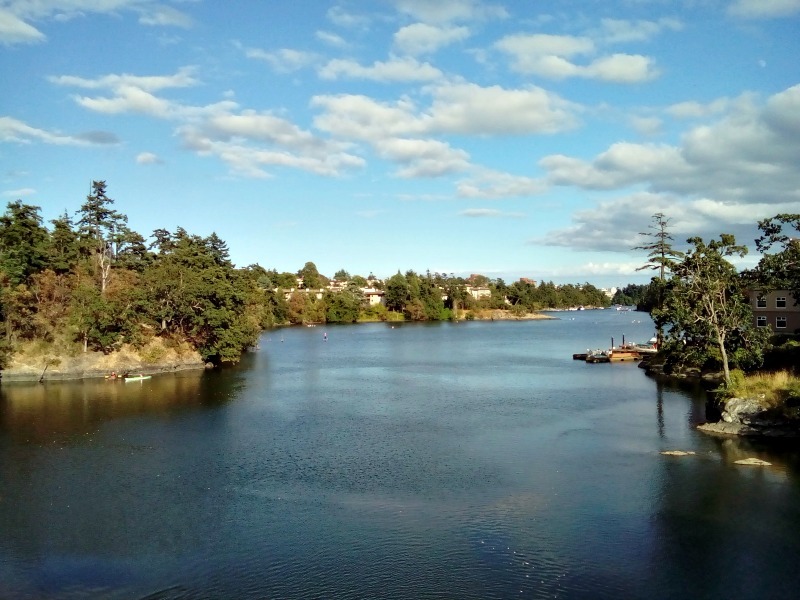 There are three or four crossing points along the Gorge so we headed north west along the side of the water for about 2 miles, crossed over and come back along the opposite bank in the municipality of Saanich. There were some stunning properties along the way and the occasional information boards with historic photos of the Gorge being used by early European settlers and information on some of the First Nations people of this area (called Songhees people). 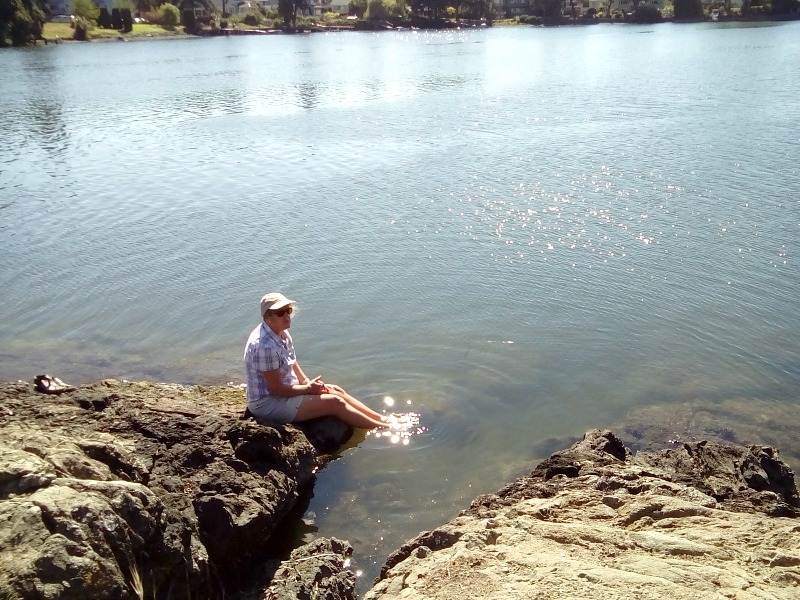 After this loop, we decided to head to Curtis Point a large group of rocks jutting out into the river which is has been a favourite spot for swimmers since the 1920s. A shady walk through the pines brought us to the Point where there were a few swimmers. I just dangled my feet in and let the fish tickle my toes. The walk along the Gorge tempted us to walk rather than bus into Victoria the next day. After a bit of nifty research by Jonno, we headed along the edge of the waterway but this time south east towards the harbour. It involved a little bit of walking through streets before we were in a park and then onto a walkway along the edge of the water. We crossed the infamous Galloping Goose Trail. This is a very well known 40 km cycle path and there were a couple of bike rental places along our route. It didn’t seem busy with tourists but there were a lot of lycra clad club type cyclists but then again it was the weekend. Looked like a great thing to do during the week on a slightly cooler day maybe. We strolled on and came to the Johnson Bridge which is locally referred to as the Blue Bridge. Although it is an historic icon of Victoria, it is looking a little sorry for itself and we didn’t feel too comfortable walking under the 780 tonne concrete counterweight block to be honest! 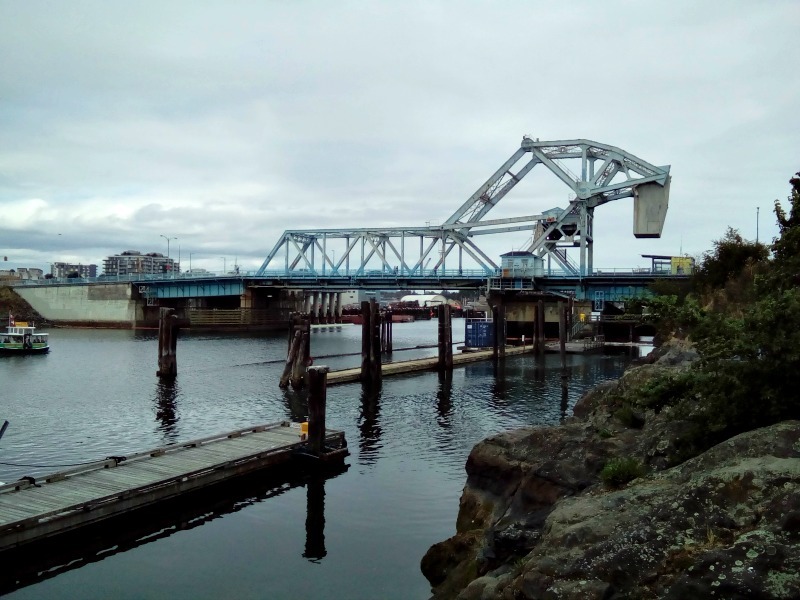 Immediately after crossing the bridge we entered the harbour walkway which had a variety of whale watching companies, little market stalls, kayak hire, seaplane dock and so on. It is was still quite early so relatively quiet. 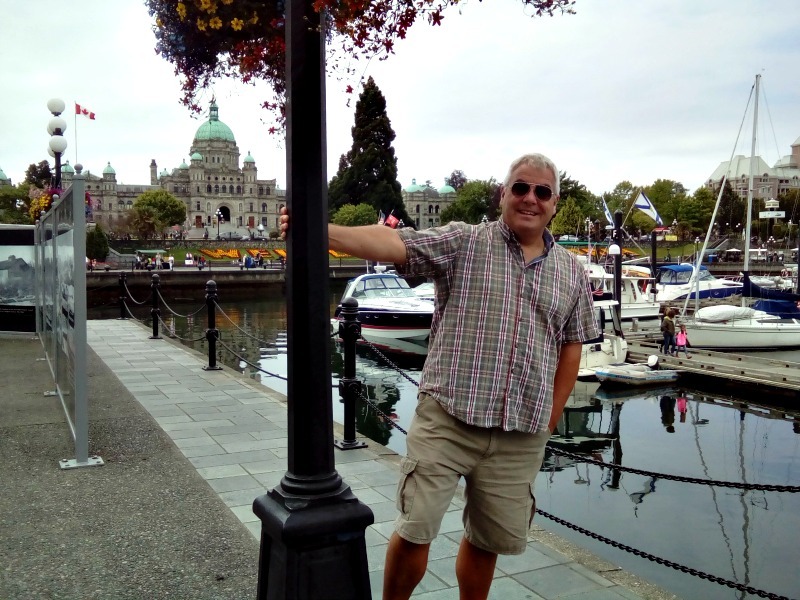 Facing the harbour is the impressive British Columbia Parliament Building which dates back to 1898. It has the look of a mixture of so many cathedrals and buildings in London. 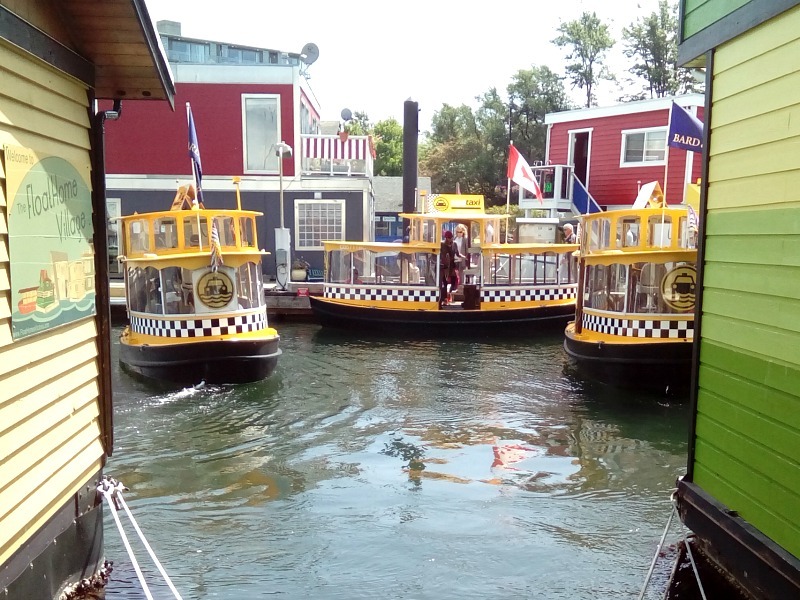 We continued our walk along the harbour and arrived at Fisherman’s Wharf. 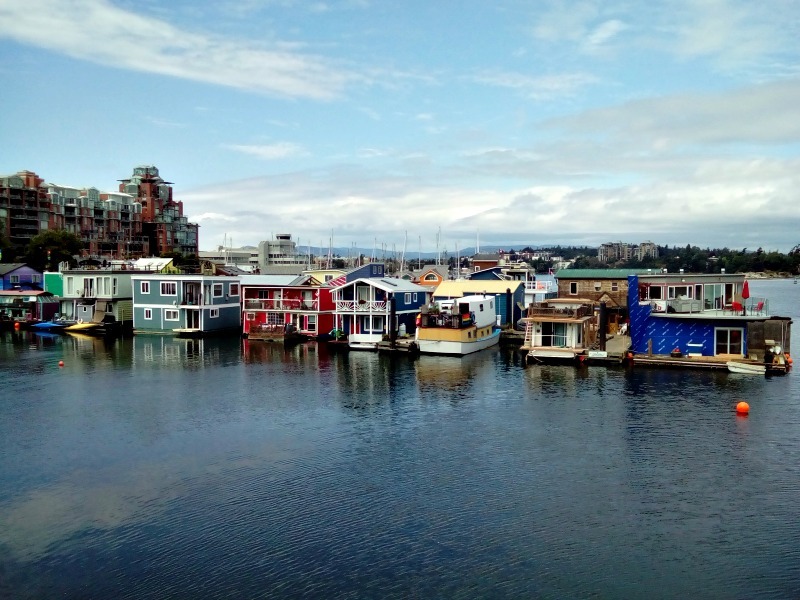 I was expecting fishing boats, of which there were some, but the main part is the float home community of around 30 what we would call houseboats. They were so individual and like an extension of each person’s personality. There was even a large float home which had been converted into a B&B. 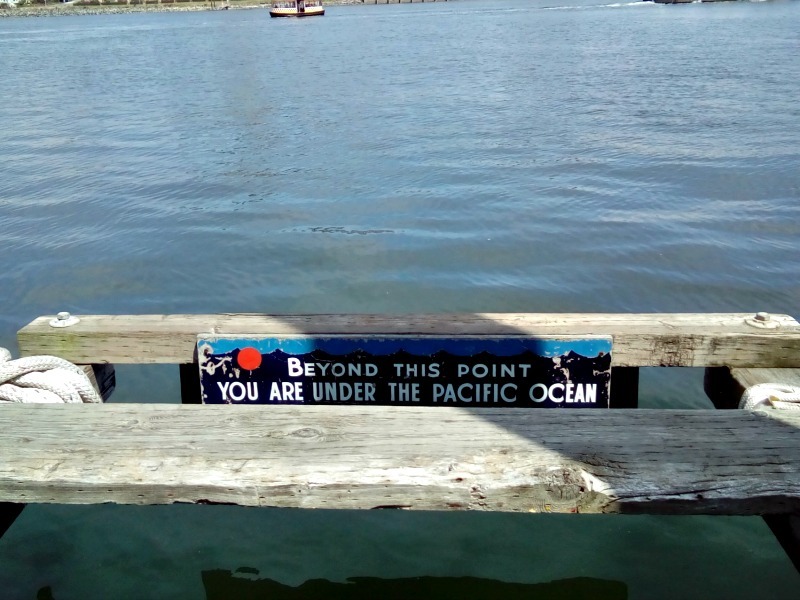 The residents must be very tolerant to have the public walking along the pontoons between them but the signs were welcoming and basically saying, please take a look but respect our privacy. 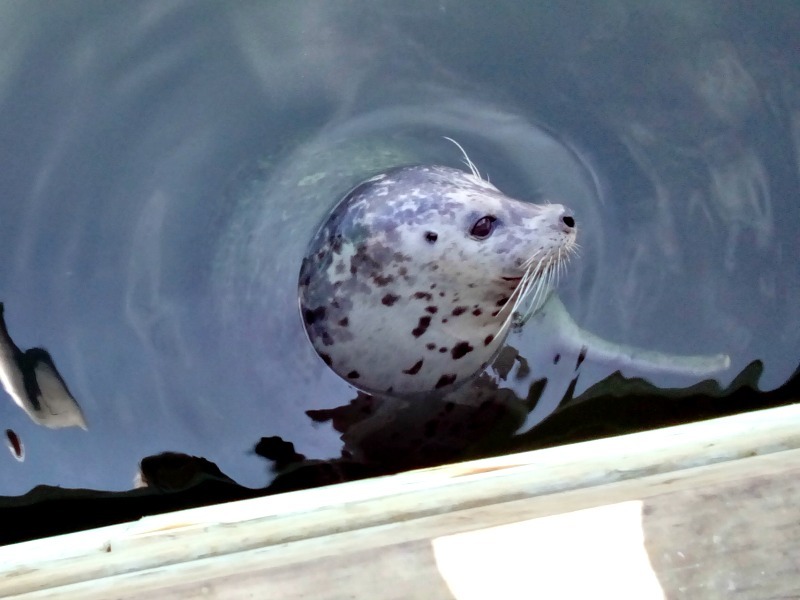 Whilst on the edge of one of the pontoons, we met a very tame seal who knew how to pose for the camera. I think he was hoping that we would buy some supplies from the fresh fish counter and provide his dinner. We were starting to feel peckish but we were too impatient to queue for the popular fish and chips on offer so instead bought huge ice creams and sat in the park overlooking the wharf. Another one of those perfect moments. However, no time to lounge around. We headed back to the harbour trail and made our way to Ogden Point. There is a very long breakwater/pier which we just had to walk the whole length of. There is something about piers that lures you to the end. It was worth the walk. We saw some divers, seals and, of course, breathtaking views across the Pacific Ocean towards America. On our return along the breakwater whilst we were trying to figure out the human sundial on the pavement, we met three retired gentlemen. Two were originally from England and one was a friend of theirs from Alabama. It felt like that had just walked out of the film “Cocoon” if you have every seen it. We chatted about all things Victoria and when and how they settled in Canada and they were aghast at our plans. You could almost here the, “What are they thinking?” racing through their minds. Another stroll took us inland to the harbour again which was now heaving with day trippers but still looked picture postcard in the sunshine. Luckily we stumbled across the Patio Bar on the rooftop of a building for refreshment before hopping on the bus to head home. We have so many places we want to see while we are here and are already predicting that we won’t want to leave. So far it has certainly been worth the wait. May have to checkout the float home for sale next to this warning. A place I always wanted to visit. This confirms it!! Get here! It is your type of place. 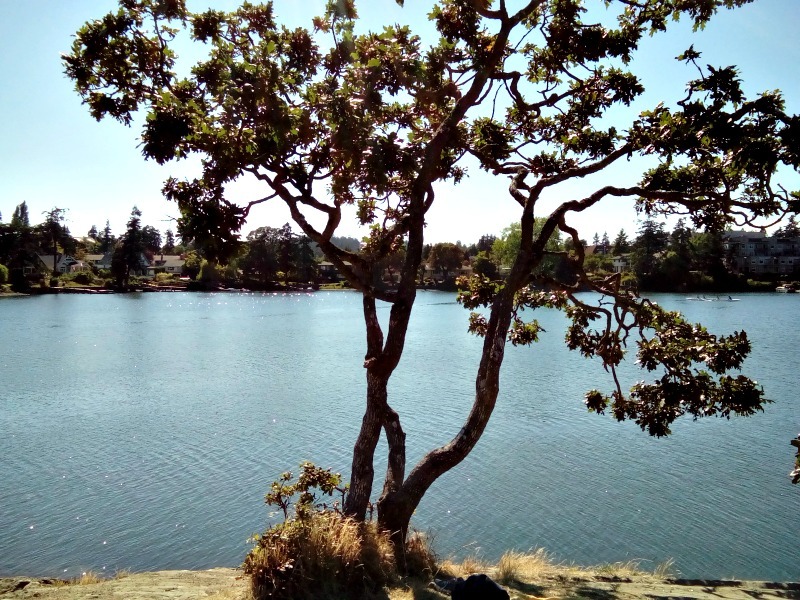 The Galloping Goose Trail has your name on it! Your posts are pulling me back to Canada – it’s been 14years since I was there. I’m loving reading about your adventures. 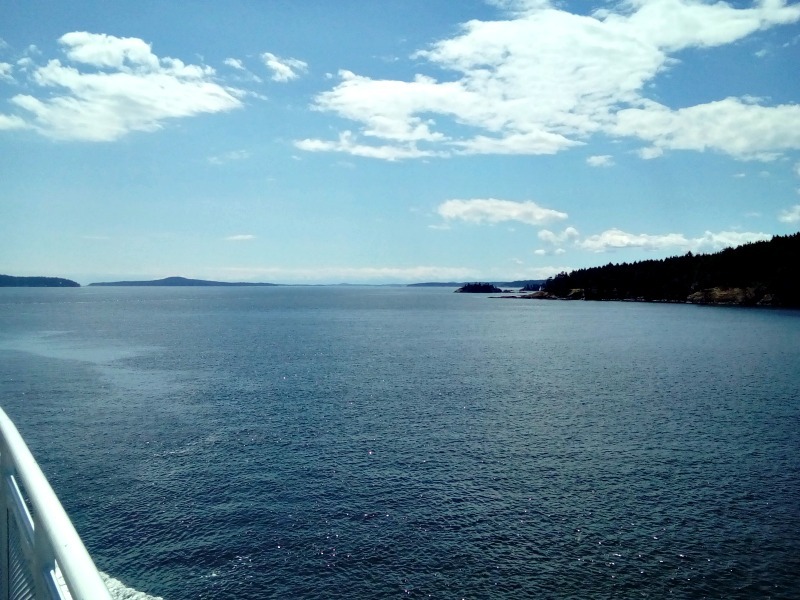 Vancouver Island is an awesome spot for boat trips to see Orca in the wild. I am sure we will be pulled back too. It has captivated us in every way. I can’t remember ever speaking to Jon about Vancouver and the islands but from that blog I can see why you would want to visit it so much and why you would think about never leaving. What a beautiful, tranquil looking part of the world. What happens to the weather in their winter? Top blog Jo. Could be pushing for my top 5. Come on – we all know your top 5 has at least 10 in it! Weather gets a bit white in the winter but in some ways that would add to the beauty of the place and, unlike the UK, according to everyone here can still get about OK! If not, work from home? With that view? Happy to get snowed in! Beautiful!!! NOW I want to go to Vancouver too! You guys are doing a great job of YOLO! BTW – there was a great article about the new British Prime Minister wearing Theresa May’s shoes in the Chicago Tribune – was that the company your daughter-in-law works for? Cute shoes! Bring the camper to Canada – it is stunning. No the shoes were not from our daughter-in-law’s company but it was a good article. Keep well! 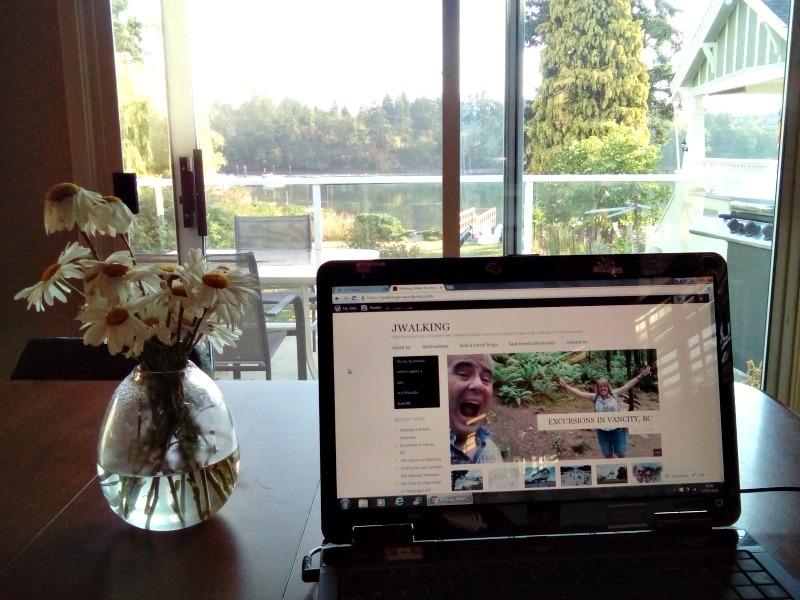 Catching up on the blogs and getting and idea of how vast, varied and spectacular Vancouver is. Great stuff!